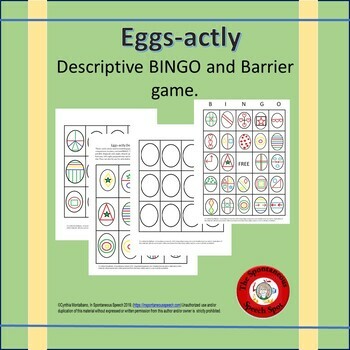 A bingo or barrier game activity to target descriptive vocabulary, perspective taking, and following multiple step directions. 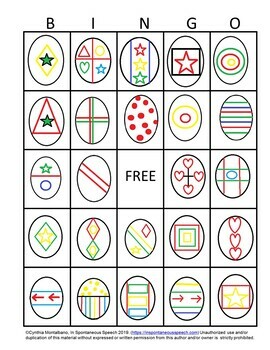 The cards range from two step (make a green star in a red triangle) to more complex directions that require 5 or more steps (draw red lines that intersect to form right angles to each other in the center, draw a red triangle in the upper left corner, a yellow circle in the upper right corner, a green heart in the lower left corner and a blue star in the lower right corner). The following vocabulary can be elicited: inside, parallel, diagonal, end, striped, spotted, across, center, corner, intersect, above, below, vertical, horizontal, half, between, left, right, perpendicular, heart, square, diamond, triangle, rectangle, and star. The package includes: 4 sheets of 12 (1 ½ in. by 2 ¼ in.) 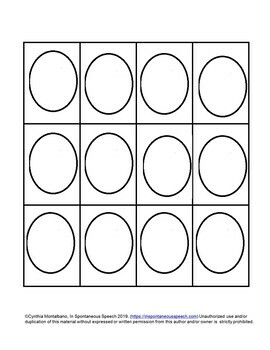 cards for a total of 48 descriptive game cards, (10 cards are of the 2 step nature, 15 in the mid range, and 15 more complex), a sheet of 12 blank eggs for student drawing when given directions by another student or creating their own design, 8 bingo cards using the descriptive eggs on the cards. These cards are perfect for matching games, go fish, following multiple directions, finding a mystery card, and bingo. 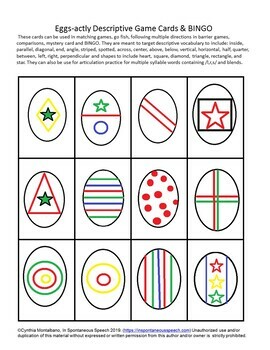 The egg shapes are good for Easter fun.